The history of beer in Mexico begins in 1864 when Maximilian I, a Vienna-born member of the House of Hapsburg-Lorraine, was proclaimed Emperor of Mexico. Emperor Maximilian brought Viennese brewers to Mexico, which influence can still be seen today. 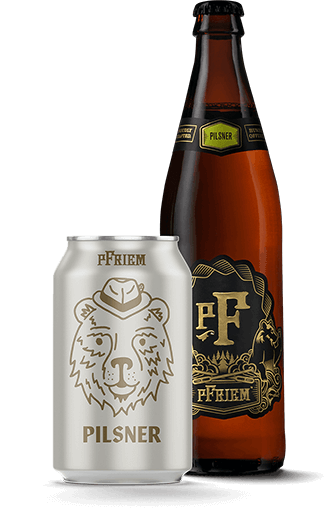 As the name implies, pFriem Mexican Lager was inspired by the light, crisp, refreshing beers of Mexico. We began with a malt bill consisting of 20% flaked maize, and built upon it with malted barley, creating the ideal background for our delicate hop addition. The beer is fermented to dryness leaving the finish memorably snappy. We love Mexican lagers, but felt many examples left something for the longing. We hope you can find that something in our version of this storied style. Salud! White foam on top of a bright light blonde body, enhanced by a wedge of lime. Aromas of light corn, orange blossom, and a hint of Mexican beach. Clean flavors of balanced malt enlightened by savory notes from the Jacobson Sea Salt. Lifts off the tongue nicely with a finish that desires more. Just about anything in the Mexican cuisine. Great with delicate fish- Mahi Mahi, Tilapia, Cod, Tuna, and Red Snapper. Great with shellfish- clams, crab, and scallops. Excellent with Sushi. Light pasta dishes work well with oil-based or creamed sauces.